Admission Process of an Institute is a very complex process. VoiceTech Solutions Pvt Ltd had understood it and had undergone through the minute complexities of the entire process and has come up with the best possible solution. VTS Complaint Management System (CMS) will help your organization achieve excellence. REFEREE is specially developed for the educational verticals. This comprehensive product facilitates the university to manage the entire operations related to student Management. The hearing and the next hearing dates of the Cases listed. Manages the case details for the corresponding days. Manages to rise alerts to the advocates on the details of the cases Recorded. Monitores each and every case status. 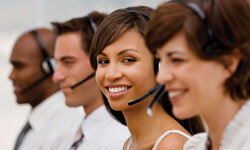 Rely on Voicetech for all your interactive voice response needs. Realise dramatic enhancement in service levels and drastic reduction in costs. Voicetech's solutions enable easy scalability and can meet your wide spectrum of needs - basic to the most sophisticated. VoisFusion is a robust platform to develop and deploy DTMF (touch-tone) applications. The product is highly scalable, reliable and sustainable. The unprecedented state-machine driven application and modular architecture enables its applications in industries as diverse as airlines, banking, insurance, network service providers and others. India's premier business magazine featured Voicetech Solutions in its story on the role of business schools in incubating new businesses. "...As luck would have it, IIM-B screened Ramakrisnan's business plan and technological competence and decided to incubate it own campus. That was four months ago,and Ramakrisnan's VoiceTech Solutions is on its way to take on telecom technology biggies like Nortel and Avaya." Click herefor the full article.